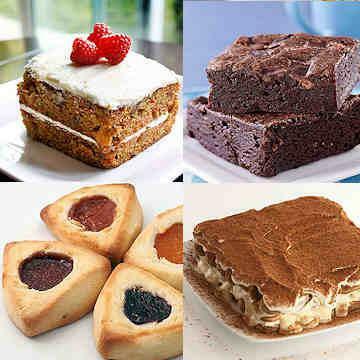 Simply scrumptious desserts, and lots of them! Great for a party or just to put in the freezer until a craving hits. You have the option to buy 2 servings or 4 servings. No heating necessary. Thaw cake. Remove plastic packaging from paper tray. Place cake onto a plate to serve. No heating necessary. Thaw brownie. Remove plastic packaging from paper tray. Place brownie onto a plate to serve. No reheating necessary. Thaw cake. Remove plastic packaging from paper tray. Place cake onto a plate to serve. Prepare from THAWED state for best results. To thaw product, remove from freezer on the morning of the day of use. Product may be kept refrigerated up to 3 days prior to use. NO HEATING REQUIRED. Remove plastic top from plastic tray. Place tiramisu onto a plate and serve. No Reheating Required. Just thaw and serve. Carrots, Soy Oil, Eggs, Pineapple, Vanilla, Sugar, Unbleached Wheat Flour, Baking Powder, Baking Soda, Salt, Cinnamon, Walnuts, Cream Cheese, Butter. Bakers chocolate (Oban wafers), butter, sugar, eggs, unbleached pastry flour, salt, vanilla, chocolate chips. Contains major food allergens (wheat, eggs). Made in a facility that also processes nuts. Sugar, bleached wheat flour (flour, niacin, reduced iron, thiamin, riboflavin, folic acid), cocoa, dry egg whites, soybean oil, baking soda, dry egg yolks, food starch modified, salt, nonfat milk solids, caramel color, natural and nature identical flavor, soy lecithin, xantham gum, wheat starch, corn syrup. Contains major food allergens (wheat, eggs, milk, soy). Made in a facility that also processes nuts. Unbleached enriched flour, butter, sugar, canola oil, water, egg powder, natural flavors. Filling may contain the following: apricot puree, raspberries, strawberries or cherries, sugar fruit pectin, citric acid. Contains: wheat flour, eggs, milk and tree nuts. Made in a facility that also processes nuts.